Neuroimaging matches specific schizophrenia behaviour to the brain’s anatomy. Differences in the size and structure of certain brain areas have been found in some adults diagnosed with schizophrenia. Early findings came from the discovery of enlarged ventricles in people diagnosed with schizophrenia. This finding has not proved particularly reliable on the level of the individual person, with considerable variation between patients. However, it has been usedin case studies with twins although it is a rather small percentage about 1 in a 100 cases of twins have shown that schizophrenia is genetic but it is rare. With an argument raging back and forth as to whether the brain abnormalities in schizophrenia are either neurodegenerative or neurodevelopmental in origin, mapping these imaging markers is a priority globally. Now, a study from researchers at Washington University has used advanced brain imaging to match certain behavioural symptoms of schizophrenia to features of the brain’s anatomy. The team state that their findings could be a step toward improving diagnosis and treatment of schizophrenia. Previous studies have shown a large number of differences in brain structure between people with and without diagnoses of schizophrenia. However, many of these differences are only reliably detected when comparing groups of people, and cannot be used as biomarker without further validation. Neuroimaging studies using fMRI and PET to examine functional differences in brain activity in patients with schizophrenia have shown that differences seem to most commonly occur in the frontal lobes, hippocampus, and temporal lobes. These differences are heavily linked to the neurocognitive deficits which often occur with schizophrenia, particularly in areas of memory, attention, problem solving, executive function and social cognition. A running argument also exists as to the role of antipsychotic medication in causing such abnormalities with studies proving inconclusive to-date. Earlier studies from the researchers reported evidence suggesting that schizophrenia is not a single disease but a group of eight genetically distinct disorders, each with its own set of symptoms. Results found that distinct sets of genes were strongly associated with particular clinical symptoms. The current study investigates the brain’s anatomy and shows that there are distinct subgroups of patients with a schizophrenia diagnosis that correlates with symptoms. This also explains the difficulty in past studies to identify a single set of biomarkers for a single type of schizophrenia. The current study evaluated scans taken with magnetic resonance imaging (MRI) and a technique called diffusion tensor imaging in 36 healthy volunteers and 47 people with schizophrenia. Results show that the scans of patients with schizophrenia had various abnormalities in portions of the corpus callosum, a bundle of fibers that connects the left and right hemispheres of the brain and is considered critical to neural communication. Data findings show that certain characteristics across the corpus callosum revealed in the brain scans matched specific symptoms of schizophrenia. The group explain that patients with specific features in one part of the corpus callosum typically displayed bizarre and disorganized behaviour. They go on to add that in other patients, irregularities in a different part of that structure were associated with disorganized thinking and speech and symptoms such as a lack of emotion; other brain abnormalities in the corpus callosum were associated with delusions or hallucinations. The lab conclude that their findings provide further evidence that schizophrenia is a heterogeneous group of disorders rather than a single disorder. The team surmise that they didn’t start with people who had certain symptoms and then look to see whether they had corresponding abnormalities in the brain. They note that they just looked at the data, and the patterns began to emerge. They go on to add that this kind of granular information, combined with data about the genetics of schizophrenia, one day will help physicians treat the disorder in a more precise way. For the future, the researchers state that it will be important to focus on how precise gene networks are linked to specific brain features and individual symptoms so that treatments can be tailored to patients. Mapping early and late deficits in schizophrenia. 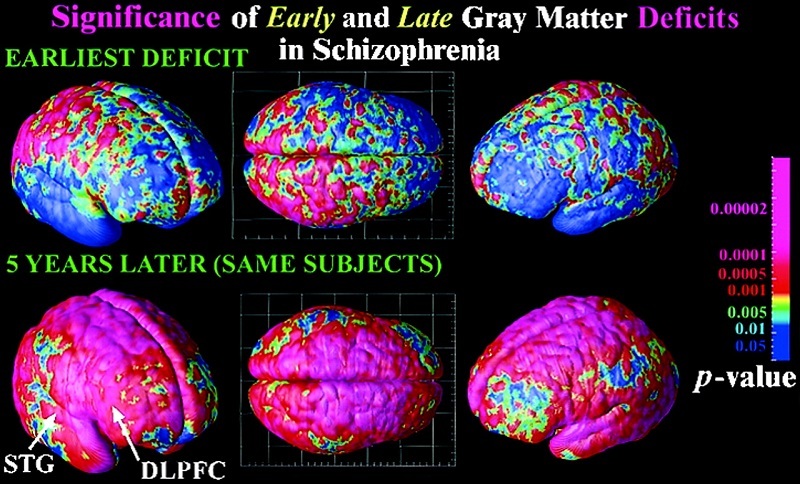 Deficits occurring during the development of schizophrenia are detected by comparing average profiles of gray matter between patients and controls at their first scan (age 13; Upper) and their last scan 5 years later (age 18; Lower). Although severe parietal, motor, and diffuse frontal loss has already occurred (Upper) and subsequently continues (Figs. 1 and 2), the temporal and dorsolateral prefrontal loss characteristic of adult schizophrenia is not found until later in adolescence (Lower), where a process of fast attrition occurs over the next 5 years. The color code shows the significance of these effects. Mapping adolescent brain change reveals dynamic wave of accelerated gray matter loss in very early-onset schizophrenia. Rapoport et al 2001. Bloody oath I agree with the pink brain outcome. Getting stoned 24/7 shuts down the brain good & proper-damn right it is a two sided medicine bringing out symptoms in all. This can be a party- the reason everyone has a drink. Or it can be a living hell.